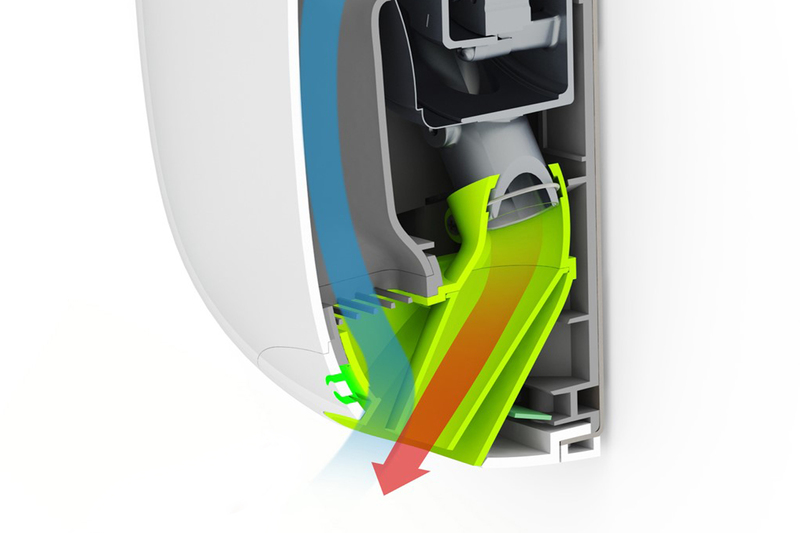 HJC Design was approached by SA Vortex, an award winning British Technology Company, to assist in developing an intelligent, environmentally friendly hand dryer that reduces energy consumption and provides real time monitoring capabilities to support efficient building management. Although organic materials are used to manufacture most paper towels, the vast majority are sent to landfill, this alone creates 2% of total landfill in the USA. The use of hand dryers within corporate and commercial environments minimise this paper towel consumption, and reduce constant replenishing and maintenance costs. Unfortunately these dryers predominantly use power hungry motors and heating elements consuming between 1100W – 2300W of energy. 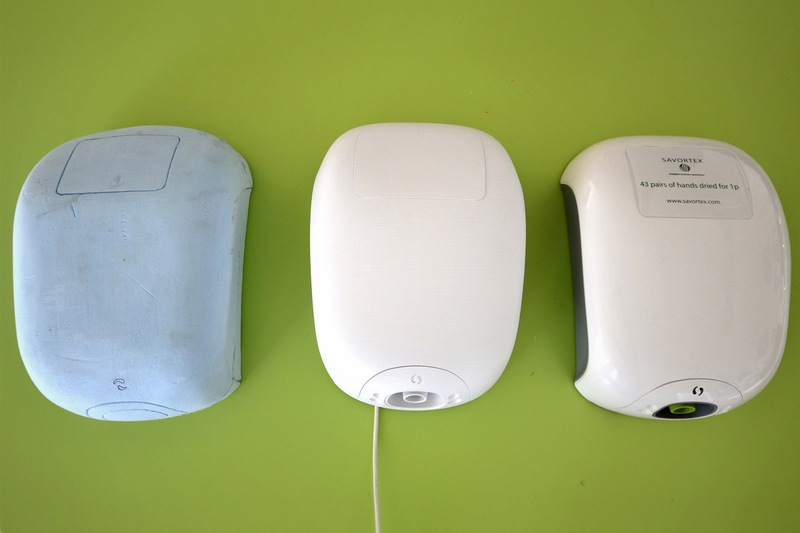 These ungainly, noisy units have as a whole failed to evolve with new materials and technology, with poorly designed and maintained units actually harvesting bacteria and dust which can then be blown back onto clean wet hands. The super-efficient 550W digital brushless motor used by the EcoCurve can dry hands within 11 seconds, equating to a cost saving of 99% compared to paper towels. Cold and recirculated air is drawn into the air channel adaptor and compressed to achieve a temperature of 39 degrees before being accelerated to 30 litres per second to deliver heat straight to the hands. Forward sensors self-calibrate on installation to accurately monitor and track hands for instant activation. The intelligent inbuilt energy monitoring systems wirelessly reports to a building management server providing crucial real time information to further minimise and manage energy allocation. HJC applied a user centred approach throughout the development process. Early research and ergonomic testing proved current slim-line dryers with vertical jets caused frequent fingertip contact with the unhygienic mounting wall. The resulting angled air manifold design directs the flow away from the wall and into the palm of the user’s hand, preventing any unwanted contact and ensuring optimum comfort when drying. Key to the designs success was the unit slimness: HJC explored numerous internal configurations early in the design process to achieve the most space efficient solution. The enclosure needed to address noise reduction whilst boosting performance and permitting future upgrade options for data communication networks and OLED screen technologies. 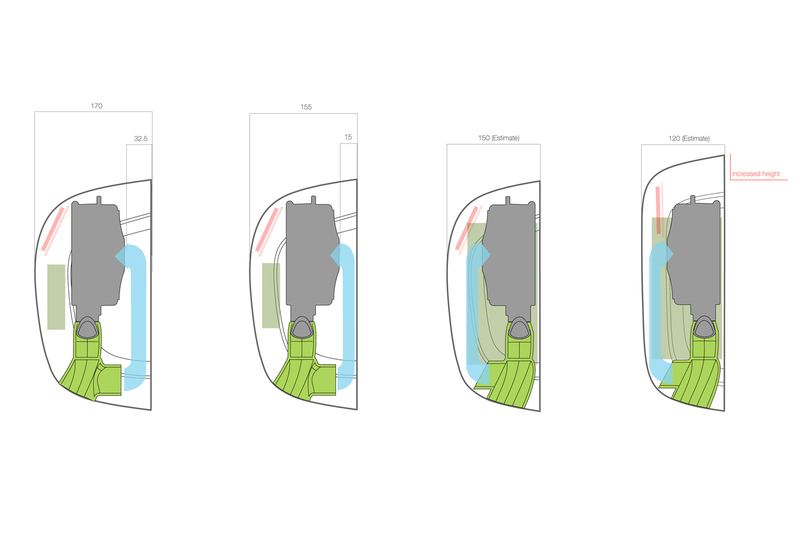 Testing multiple and single jet manifolds identified the optimum design configuration for the heat recycling chamber, maximising both air flow and compression, to generate warm air and reduce noise levels to 87dB. In line with the SAVortex air recycling system HJC developed an inner chassis with integrated air channel to control the air through a direct route back into the blower. This inner chassis isolates the data communication hardware and media screen protecting crucial electronics from the influx of moisture constantly present within the recirculating air. All major mouldings are injection moulded from recycled ABS and PC/ABS blend incorporating antimicrobial additives to protect against bacteria. Injection moulding allowed complex parts to be developed to reduce components and weight. The use of threaded inserts has been minimised and restricted to key components to allow easy repair and disassembly for recycling.